The beauty of Ezhattumugham is something which comes to close to making an impact similar to what Daffodils made to Wordsworth, but considering the beauty of Kerala as a whole, and for a Keralite who manages to see similar things every day, it might not be a big deal. Still, at a time when the nature is diminishing even in God’s own country and the nation as a whole, due to the materialistic tendency and the industrial nonsense, there is the need to witness the beauty of Ezhattumgham, the land of seven streams – the seven faces of a river which flows in a different style through different parts of the rocky areas. If the Spanish football team has eleven wonderful players who merge into one unit, this has seven. The pathetic losers who can’t admire the Spanish victory can also fail to admire the beauty of nature on this occasion, as the beauty and truth are the same here and also evident in the Spanish victory, in a simple selfless game, not brutal and ugly as Netherlands showed against Portugal in the 2006 FIFA World Cup and against Spain in 20120 FIFA World Cup. Those teams which play cannibalistic football, thus creating a Battle of Nuremberg and continued to do the same even in a big stage of World Cup finals, had to lose, and so should the people who see nature with a destructive eye. The victory of Spain in UEFA Euro 2008, FIFA World Cup 2010 and UEFA Euro 2012 was a victory of both truth and beauty, and as John Keats said in this beautiful Ode of timelessness, beauty is truth and truth beauty. For the last few years, that beauty was Spain in football, and it will continue to be so and it wouldn’t matter if they continue to win or not. The game will continue from their boots with that same beauty as comparable to the flow of nature and anyone who speaks against it is surely a criminal to both beauty and truth. It will eventually cause the rise of the most evil souls from hell and the gate to inferno would open directly to Earth. The nature itself would have its revenge, something which it has been waiting for, ever since science started destroying its soul. The mocking of the best, just because of jealousy, is that evil which can come next only to the vanity which exists inherent within cricket that makes a few teams superior to the others, that is evident with the Nokia Champions League T20 and its partiality – 10 teams; 4 from India, 2 from Australia & 2 from South Africa; that is 40% reservation for Indian teams & 80% for teams from these 3 nations. When the other teams agree that they are inferior and promote the vanity of the so called ‘higher race of teams’, everyone has to give up and accept the superiority of those overlords. Feudalism and racism got many new forms for sure. Euro 2012 might have saved Indian sports fans from listening to any more of Sania Mirza’s selfish comments which might be responsible for a possible fall of Indian Tennis in the future. 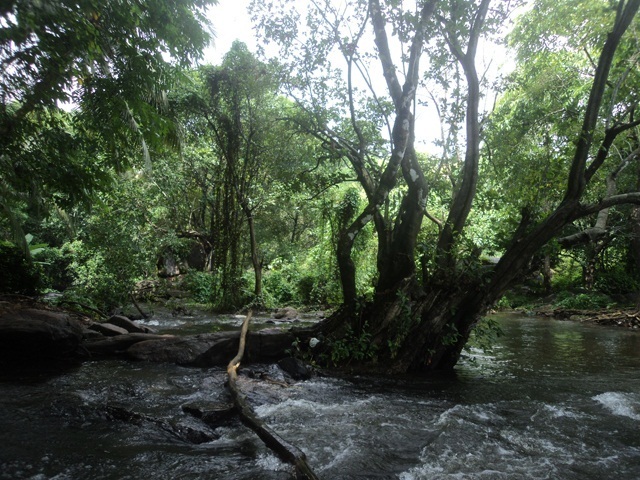 But Ezhattumugham has been taken away from the people and the tourist map more by the Athirappally-Vazhachal Waterfalls which has always been a huge tourist destination. Its popularity has actually made Ezhattumugham a less significant place of interest. In the case of Kodanad and Paniyeli-Poru, the same thing has been working in a different manner, as Paniyeli-Poru has been rising above Kodanad as the new place of natural relief. Even the condition of the roads seem to tell the same story of neglect. There are no signboards either, except for the directions to Athirappally and two major water theme parks which are located nearby. The easier path from Cochin to Ezhattumugham would be a right turn at Karayamparambu, just after Angamaly, easily identified by the end of a bridge and the view of the huge white dome of Saint Joseph’s Church. A few kilometres later, the path is confirmed to be correct when you see the Mookkannoor church straight in front of you during a left turn. Then comes the time when you have to ask and ask for directions, thus clearing those uncertanities about reaching that world of serenity. At a time when the glory-hunters supported Germany (unlike the true German fans who have been supporting their team for years) and the physical people supported Netherlands, the true football lovers had stuck with Spain. For the exact same reason, Ezhattumugham is a place to be stuck with. It is comparable to Paniyeli-Poru on many occasions. The first thing is the absence of sign boards, even as Paniyeli-Poru has directions towards one side. There is also the flow of water between those rocks which is a wonderful scene. Both are not exploited that much, as they are not the most popular tourist destinations yet. They are rising, and will soon reach the major list of Kerala’s tourist attractions. A few bad and narrow roads are to be made better and the sign boards are to be effective. Then the rise would be quicker, and they would reach that higher level; as both are not too distant from the Cochin International Airport. Athirappilly surely has glamour and might continue to win many hearts, but Ezhattumugham is what wins with its beauty of variety. Nature rules over individual beauty of waterfalls. In a world of scientific reasoning, people may argue with facts, but as nothing of this world is real, one has to wonder what they are trying to prove with their God particle instead of using the money to save the poor and treat the diseases. The path through Chalakudy and many other shortcuts should also reach there, but the previously mentioned route should be the easiest as well as the most beautiful. There are palm trees on the side too – something you don’t see very often in Kerala. It was as if the Coconut trees took a break. There are also the mini-waterfalls – or should they be called micro-waterfalls? There is significant beauty in there, and it doesn’t really matter how small they were. All those underrated places of beauty, the same as the Spanish team. They said Spain will never win any tournament and will choke in Euro 2008 and they supported the team with most chance of winning. They felt that Spain is not World Cup material and for World Cup 2010, they supported the teams which had the best chance. At a time when Spain was not considered favourites and was weakened by the absence of Villa and Puyol, they still supported the team with the best chance to win. Now the question would be – who are the glory-hunters? It is them who say that Spain won’t win and support a team with maximum chance to win, and after that team loses, they will support every team against Spain. This is exactly the same feeling, a few people had against Brazil sometime ago – the same itching people have against Roger Federer and Sachin Tendulkar envying their achievements. They would also speak against Who Wants to be a Millionaire’s Malayalam version Ningalkkum Aakaam Kodeeswaran, and their action would be part of another story of blind celebrity worship and a form a typical story of envy against people earning money more by knowledge rather than those silly reality shows. Ezhattumugham is not a place to fade away due to some people preferring only the places mentioned in the list; it will live on and it will gain more and more strength by the people who strive, seek and refuse to yield. They will find these new places and bring them to light; they will find the truth behind everything fake. They will rise like Spain and win their battles, not in a rough, pathetic path of some negative teams; but like a poetry in motion. For now, the glory is with those who play a selfless game and not with the mindless goal scoring machines of selfishness. Portugal and Netherlands would also rise to get to glory for the first time, if they keep closer to the beautiful game as it is called. When the Prakriti Gramam, the park at Ezhattumugham becomes better maintained with superior security, its rise will be comparable only to the Spanish rise; there is so much talent in nature which is total in itself just as the Spanish team of Total football. The people who can’t appreciate beauty will continue to be those hurdles in the path of truth and greatness. They will succeed in their path, but will eventually destroy the world around them, like science destroyed faith, belief and true love. But the thing to be kept in mind is that perverted ideas of beauty are not to be included. It is not something to come from a drunken state either. There is no beauty without truth and vice versa. Ezhattumugham asserts it in the right manner. For those who are wondering about the content, this was written just a few days after Euro 2012, a month after the Ezhattumugham visit. This is a quick impact of Euro 2012, and do forgive the writer for the overspeed.